shallow eyes, red skin, yellow flesh. Sprout: Purplish red, cylindrical, medium to dense hairiness. pigmented, with wings slightly pronounced in straight majority. rounded oval (I = 1, 68); Semi-Knocked limb. Grading: Proportion of large tubers: high enough. Virus Y: slightly susceptible. Leaf roll: moderately susceptible. rust, hollow heart and black spots. Susceptibility to sprouting: Moderately susceptible. 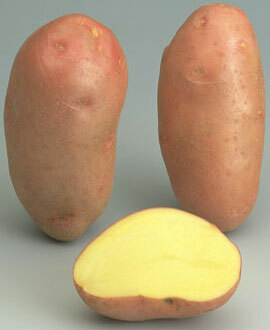 of beautiful presentation variety with tubers with red skin, very regular shape and very shallow eyes.